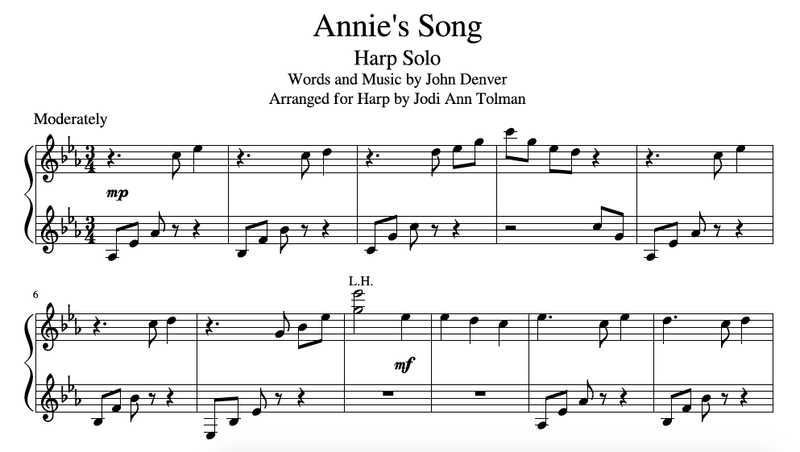 This beautiful love song by John Denver is arranged for solo harp. It is a simple arrangement that is easy to play and falls easily under the fingers, but also has a full sound. Advanced beginner harpists can learn this piece which sounds more challenging than it really is. I grew up listening to John Denver and still enjoy many of his songs. I wrote this arrangement because this song is one of my favorites of his, not only because of the sweet message, but because my oldest daughter is also named Annie. She has Aicardi Syndrome, which causes severe disabilities and shortens her life-expectancy dramatically. But despite her challenges, she loves sharing her beautiful smile. This song makes us think of her and all the joy she brings to our lives.